transferred from the fry tank to the barrel. for the table and compost for the garden. After some study and experimentation, we have set up a productive food chain-- table scraps to earthworms to catfish--in our back yard. The project is satisfactory in many respects, utilizing waste materials to produce fresh fish for food and at the same time yielding ample compost for a small garden. The material cost is minimal. The whole operation can be set up for less that $15.00. The equipment occupies only about 12 square feet of space, and the entire assembly can be easily moved if necessary. 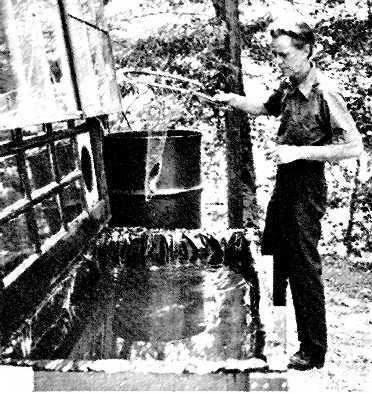 The materials can be very simple: Two 55-gallon steel drums, three panes of glass 24 inches square, and a medium-sized aquarium air pump. 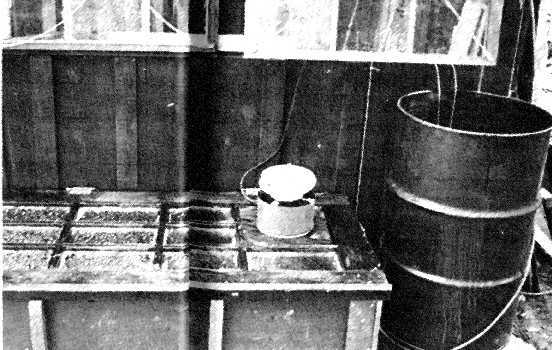 One of the drums will serve as a tank for the fish, oxygen being supplied by the air pump; and the second drum should be cut in half to provide two bins for the worms. The panes of glass are used as covers for the worm bins and fish tank, and for ease and safety in handling can be framed with scrap lumber. We chose catfish because they are readily available in our part of Alabama, and reach eating size in a summer. Various small members of the sunfish family, such as bluegill or bream, would also be suitable. While we readily admit that our plan has no commercial possibilities, we know that we can produce, for our own table, tasty fresh fish that is uncontaminated and costs practically nothing, both considerations being highly relevant at this time. Fish are usually efficient food producers; a one-pound fish yields approximately 10 ounces of food. Further efficiency is indicated by the fact that fish fed on commercial fish ration convert about 85 percent of their food to meat. While we are not prepared to compute the technical data about food conversion in fish on an earthworm diet, we can readily state that the fish relish earthworms, and do grow well on this food. Spraying the water back into the tank aerates the water and at the same tie releases the ammonia produced by excretory matter in the water. Because the oxygen requirements of fish are quite high, the faster the circulation of the water, the faster the growth of the fish. We decided to keep our equipment as simple and inexpensive as possible at the beginning, but to use the maximum stocking density advised, keeping 40 fish in a 55-gallon drum. Although inexpensive circulation pumps are available, we chose to use a METAFRAME HUSH II aquarium bubbler for oxygenation and a garden hose to siphon off water from the bottom of the barrel. We take off 15 gallons of water per day, but as we run the waste water onto the worm beds and adjacent garden, the cost is negligible. Although we have creek water close at hand, we were advised to use city water to avoid the introduction of undesirable algae and fungi that might be harmful to the fish. Because city water is usually quite highly chlorinated, it is necessary to draw the water in 5-gallon buckets and let it stand for a day in the sun before emptying it into the drum to replace the water siphoned off. We have seen no evidence of oxygen starvation in the fish with this method of water circulation. The most important variable we have found is water temperature. Catfish will feed at temperatures as low as 40 or 45 degrees, but their greatest growth is achieved at 84 degrees. We noticed a decided increase in feeding activity when we painted the barrel black and moved it into full sun. Leaving the buckets of water in the sun not only speeds chlorine dissipation, but warms the water as well. In areas where city water temperatures are close to the growth optimum, the chlorine can be removed by setting the hose nozzle at fine spray, and the barrel can then be filled directly from the water supply. Although summer growth is greatest, the project continues throughout the year. By judicious use of sun when possible, plus auxiliary heat when necessary, winter growth can be kept at a fairly high level. When water temperatures are right, the fish will feed so enthusiastically that they may leap completely out of the barrel. For this reason the top of the barrel should be covered completely with a pane of glass which will also help in keeping the water warm. Because fish feed most eagerly in late evening and early morning, we feed them at these times of the day. As with earthworms, care must be taken not to overfeed. In warm water and bright sunlight, any uneaten worms will die and decompose rapidly, giving off gases which are poisonous to the fish. Transferring any grown animal to a confining environment produces the equivalent of cultural shock, and is followed by a period when feeding is light and growth is slow. At this time special care must be taken not to overfeed. Unless fish can be found that have been hatched and grown in a tank, small fish should be selected to stock the barrel, as their adaptation time is proportionally shorter that that of larger fish. To eliminate as much transplanting shock as possible, we use a large wooden box, lined with two layers of polyethylene sheeting and covered with an old door, to stock with fry. By the time the fry reach fingerling size, they can be transferred to the barrel as replacements are needed, and very little shock is evident. An insect lamp over an opening in the cover of the fry tank permits the small fish to eat at night while ridding the garden of night-flying pests. Earthworms, as any angler knows, are food for fish in their natural habitat; and most fish in captivity prefer live food to the dehydrated type. Kitchen scraps make excellent food for earthworms, and even the most careful organizer will have enough refuse to feed, quite handsomely, 5,000 to 10,000 worms. We found that growing earthworms at home is not difficult. The basic materials are easily arranged, and the earthworms' demands are simple. All they require are a protective container, reasonable temperature control, adequate moisture, not too much food, and a light loose bedding which is never allowed to become acid. The steel half drums are ideal worm bins as they are effective protection against the earthworms' predators in addition to being quite inexpensive. They have the added advantage of being movable so that as cold weather approaches, the worms can be carried to an enclosed porch or basement to continue composting activity and fish food production throughout the winter. Each half-drum will house between 4,000 and 6,000 worms. The two half-drums are utilized most effectively if they are alternated so that the worm population is allowed to build up in one, while the second supplies the fish food. The eggs that remain after the worms are removed will serve to start a new supply when the first drum is converted to feeding. Worms will start breeding when they are about 90 days old. Each worm, possessing reproductive organs of both sexes, will produce an egg capsule per week, containing from three to 25 eggs apiece. The most economical way to establish worm bins for a home food-chain and composting operation is to begin with capsules. Although a little more time is required initially, there will ultimately be more worms available to work with. Under the protected conditions of a worm bin, the survival rate of young worms is very high. The type of worm selected is not important. There are two compost-bait types raised commercially -- usually known as "brown-nosed worms" and "red wrigglers." Either type may be purchased from most dealers. The bedding for the worm bins may be any organic material that is water-absorbent and does not pack so as to exclude oxygen and impede the worms' movement. Leaves and old straw are good, as is aged sawdust soaked in several waters for a week or so. Ground peat moss, being odorless, is ideal if the worms are to be kept inside. Soil should never be used as it contains no nutriment and is likely to pack. It is safe to assume that earthworms can eat any kitchen scraps except citrus rings, vinegar dressings, and bones. Though they eat almost anything given them, their intake of food, and likewise the production of compost, can be increased by frequently feeding foods that are especially tasty to them. The prime consideration is to avoid overfeeding. Although worms thrive on decaying food, they should never be given more than they can consume in 24 hours. The dangers of acidity cannot be overemphasized. It is the only real hazard in worm raising. Acid bedding frequently destroys an entire worm farm in a few weeks. To maintain accurate control over the acidity, one should use a soil test kit or a pH test strip of the type used by industrial and medical laboratories. Tests should be made at least once a week, and the pH factor (degree of acidity) should remain between 5.5 and 6.5 on the scale. A reading of 5.0 or below means danger, and immediate steps must be taken to neutralize the bedding with an application of pure ground agricultural limestone. It is important to read the label carefully to verify that the limestone does not contain any added phosphates which also bring disaster to a worm bed. The drums should be located in an area protected from temperature extremes. Optimum temperatures for feeding and growth are between 60 and 70 degrees, but worms will thrive in most summer climates if the beds are well shaded and the bedding is kept loose. During the summer months, the bedding must be sprinkled daily, but it should never grow soggy. The glass tops on the half drums serve to conserve moisture, but they will not prevent crawling. Worms have a tendency to roam at night during damp or rainy weather unless preventive measures are taken. A small light over the bed is an effective deterrent to their wanderings, while an equally effective measure is to cut a remnant of carpet to fit the drum exactly and lay this on top of the bedding. The table scrap-earthworm-catfish food chain, even from its inception, was never intended to evolve into a money-making project. It was simply an effort toward a better way of life through cooperation with the forces of nature; and in this respect, our project has been a complete success in more than one way. First of all, we have a regular supply of fresh fish at minimal cost. A seven-ounce catfish fingerling grows to 25 ounces in a summer, thus producing a pound of food in four months. In the second place, we have netted ample compost for our vegetable garden, thereby further insuring a low-cost and nutritive food supply. In addition, and perhaps this is the greatest benefit of all, we have the satisfaction of working with growing things and the gratification of knowing that we have not wasted the earth's resources. We have made an elementary biologic principle work in our own back yard. EDITORIAL NOTE: Because we believe many of our readers will want to raise catfish on their homesteads, we referred this article to Dr. William O. McLarney, of the New Alchemy Institute, Woods Hole, Massachusetts, for review. The questions he raised were then referred to authors Philip and Joyce Mahan, whose replies appear below. The fist were channel catfish. Our fish were not fed exclusively on earthworms in that we started them on commercial catfish food. Because it is very difficult to teach pond-grown fish to eat in confinement, we offered them exactly the same food they had been eating in the pond. We continued these rations for about four weeks before their response was sufficiently enthusiastic to risk changing food. Then the earthworms were introduced gradually -- a few at a time -- until the fish accepted them. Some of the fish recognized the worms as food immediately, and within a week the water literally boiled when the worms were thrown in. We wondered, then, if they might not have started eating more readily if we had used the worms initially. Weight of fish: We don't have any figures at all on the weight of the fish we started with, and we didn't weigh any before we ate them. As we stated in the article, we began with 40 fish -- fingerling size. Although we arrived at this number on the basis of Auburn's ratio of water as estimated by the fish farmer from whom we got the fingerlings. He didn't weigh the fish and we don't remember what that estimated weight was. We didn't know this thing was going to work. Earthworms: Again we have no figures on pounds of worms used. For reasons of ethics (we advertise in OGF), we didn't mention in the article that we are in the worm business. Since we have so many worms around, it just didn't occur to us to keep records of how many we used. We simply tossed the worms into the barrel until the fish stopped eating. We fed once a day, but we don't think that all of the fish ate at every feeding. I would estimate an average of 75-100 worms per day. The worms were small, not weighing more than an ounce per hundred. We were careful not to feed breeders to the fish. Table scraps: We have been feeding table scraps to earthworms for a number of years; and to date, we have not weighed a single scrap. We can, however, offer fairly precise figures on this step. Earthworms are reputed to produce their own weight in compost daily; but our experience has not indicated that they really do. A thousand worms weigh 13 or 14 ounces, but daily feeding per thousand does not approach that weight. We usually keep a container of around 2,000 composting worms in the kitchen, and I give them a couple of table spoons of selected (that is to say, soft and mushy) scraps each day. In liquid measure this amount would be only two ounces. It never occurred to us that a nutritional deficiency might develop in fish fed only on earthworms. I doubt that either of us would have recognized malnutrition if it had occurred. As we don't have backgrounds in biochemistry, we are not in a position to make any statements concerning the nutritive value, qualitative or quantitative, of earthworms. We did definitely notice a considerable increase in feeding activity when we started giving worms. In fact, we ate our first fish -- seven of them -- when they were only ten inches long because they jumped out of the barrel, and we didn't want to put them back for fear they had been injured. We feed our tropical fish (Red Oscars) earthworms also, but we can't continue the diet for more than two months at a time because the fish get so lively and eager for food that they leap out of the aquarium whenever we lift the cover for feeding. I would say we are inclined to agree that earthworms are a near-perfect fish food.